Stair waterproofing systems exposed to the outdoor elements always cause the owners or managers of public buildings to squint. These areas of public and even private access are ripe for lawsuits. Slip and fall cases are all too familiar in the courtrooms across the nation. Usually economically minor, these cases are often referred to as ‘go-away-cases’ because the settlement amounts are so small. The problem has more to do with the frequency than the settlement amount. Even more important, responsible ownership is the main impetus behind waterproofing steps and entryways exposed to the elements. The Empire State Plaza recently updated its waterproofing of the steps leading to its world-renown State Museum. With thousands of people visiting the museum annually, the care and maintenance of the common areas is particularly focused on safety. After years of heavy traffic and the challenges of the weather, from season to season, the administrators chose to tear up the granite steps of the grand staircase, storing them on-site for later use. Cracks resulted in leaks and water damage. It is very common that when one component of a structure breaks down, it ultimately impacts other components. The cracks in the staircase lead to undermining the exterior marble panels. With both an eye on safety and limiting lawsuits, the museum removed the marble panel only to discover that the flashing (waterproofing) had deteriorated because the water from cracks in the staircase was able to penetrate both sides. This put the underside of the structure holding the marble panels at risk of failure. When the decision to repair the stairway and panels was finalized, the administrators opted for the current technology in membranes as the best waterproofing material that would meet the special needs of a high-traffic area subject to seasonal weather changes. In Missouri, the capitol underwent renovation. Even a century ago, surprisingly, builders used waterproofing techniques. As in New York above, many of the “membranes” used began to lose the ability to block water and are quite outdated. Lead sheeting was once used. The sheeting expanded and contracted because of weather changes, eventually breaking down and cracking. The result was that the underlying structures holding up the staircase begin to fail. Missouri, like New York, decided to update with the polyurethane membranes, and other materials, that respond by stretching to respond to changed conditions while leaving the substructures unaffected. Not thought of as a stairway is the escalator. Waterproofing is usually overlooked when it comes to this structure. But in public places where weather changes seasonally from snow, rain etc. and experiences high-traffic levels, it becomes extremely important. People track water into the buildings and on to the escalators. Though not as severe as that experienced by outdoor stairways, the problem is real. Many of the challenges to the escalator’s viability come from other adjoining structures, making the “moving stairway” a potential danger to the public. The Hudson Yards was recently sued. Though the traffic wasn’t the cause of the slip-and-fall suit, the leaky ceiling above the escalator proved at fault. In this case, it was the construction method employed to tie the ceiling pieces together. A change to direct-fixation track is now the recommended technique, using elastomeric pads sandwiched between the concrete slabs. The metal substructures are usually protected by run-off techniques and using rubberized and silicon material that layer the metal in areas prone to the water. Unfortunately, this case proves that overwhelming an escalator’s waterproof system is very possible. 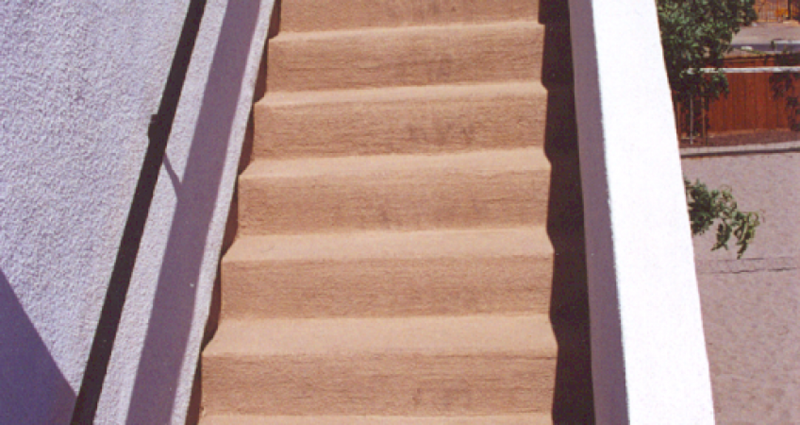 Contact us, Pli-Dek Systems, to learn more about waterproofing stairways and steps and the circumstances that are unique to your specific needs to assure safety to all on your premises.